For Harvard medical students interested in clinical and translational research opportunities, it can sometimes be difficult to know where to look for information. HMS is a complex place, with 15 hospital and research facilities and nearly 11,000 faculty members. But for some, the path to connection became a bit smoother at the second annual Bench to Bedside: Clinical and Translational Research Fair in the Tosteson Medical Center Atrium in January, an event that drew scores of students and dozens of faculty members from research teams who were all looking to make a match. Faculty are also looking for a way to meet students who have a passion for research but who might not know yet where they will fit in, Reede said. “I think part of it is, being first-year students, we don’t always get exposed to the magnitude of what’s going on here,” said Maya Ball-Burack, who attended the fair to get a sense of the scope of work being done at HMS and its affiliates. “I’m interested in emergency medicine,” said student Henry Ashworth, who was hoping to make some connections with faculty who are working in community health as well. “Trying to navigate your way through all the institutions and find out what your passion may be can be a difficult path,” said Lee Nadler, HMS dean for clinical and translational research and the Virginia and D.K. Ludwig Professor of Medicine, speaking to the crowd gathered in the TMEC atrium. 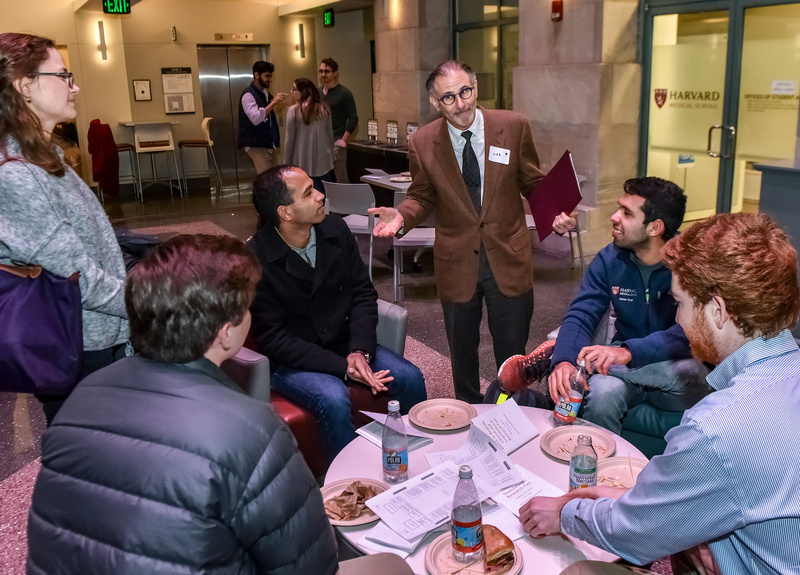 Nadler is the founder and principal investigator at Harvard Catalyst, which co-sponsored the fair along with the HMS Scholars in Medicine program. Harvard Catalyst works to foster an environment where scientific discoveries can be more efficiently translated to improve human health. It is one of a network of more than 57 translational centers across the U.S. that are funded by the National Center for Advancing Translational Sciences. Alex Cortes a fifth-year student, said he had become involved in orthopedic surgery research by working with Jeffrey N. Katz, HMS professor of medicine and director of the Scholars in Medicine program, who took the time to mentor him. Meg Lippincott, HMS instructor in medicine at Massachusetts General Hospital in the Endocrine Division, was busy at one of the tables talking to students. She said she hoped to inspire them to consider careers in research. “We’re dedicated to research and we want to share our passion with them,” she said. Other participants at the fair included faculty from the Department of Radiation Oncology at Beth Israel Deaconess Medical Center, the Tothova Laboratory at the Broad Institute and Dana-Farber Cancer Institute, the Division of Genetics at Brigham and Women’s Hospital, and the Division of Newborn Medicine at Boston Children’s Hospital. A total of 35 research groups participated in the fair. “[Faculty] see this as a way of sharing their enthusiasm for the work they love,” said Reede.